Interactive Brokers have been in business for more than 40 deals and they currently have capitalised equity capital of over $6 billion. Most of their emphasis is on professional and institutional investors. They now have a presence as a broker-dealer in more than 120 market destinations across the world. They have a wide range of investment products to choose from and they are responsible as a whole for more than 800,000 trades each and every day. Their headquarters is based in Greenwich, Connecticut and they have offices across North America, Europe, Asia and Australia, with more than 1,200 employees. They are regulated by the FCA, NYSE, FINRA and the SEC, as well as other global regulatory agencies. They are constantly looking to innovate and push the boundaries in the broker-dealer space. In 1017, they were one of the first broker-dealers to offer their clients access to trading Bitcoin futures for example. This Interactive Brokers broker review will look at the various aspects which makes the broker stand out from the crowd. There is a mind-boggling amount of global investment products you can invest in as part of the Interactive Brokers offering. As they are catering for professional traders, they need to ensure that they have some of the most cost-effective costs in the industry, something which they deliver upon. While they have their customer support team contactable on a 24/7 basis, the response time can be a bit slow. If you are more of a passive trader, you will be faced with monthly inactivity fees if you don’t generate $10 worth of commission for the broker in the calendar month. Create technology to provide liquidity on better terms. Compete on price, speed, size, diversity of global products and advanced trading tools. As the main focus for Interactive Brokers is on the institutional and professional traders, it is vital that they have very competitive cost structures. This is something that they have been delivering upon for some time now. They are one of the best brokers in the space today when it comes to the efficiency of executing orders. They have the lowest margin rates in the sector, going as low as 1.66% for those clients that have assets worth over $1 million in their brokerage account. There is a per share rate of $0.005 in place. The main benefits with their price structure are if you are dealing with smaller orders, as they are very cheap. However, once you get into buying a few thousand shares, the fees start to get somewhat pricy. There are some side fees in place for those who have inactive accounts. The main platform that is part of Interactive Brokers is that of the Trader Workstation. This gives you the ability to trade all types of global assets. They have a very efficient manner as a result of having such a high volume of options. Everything is well organized and there are customizable options available depending on the preferences of the given trader. It has great charting capabilities and a slew of technical indicators (more than 120). The charting experience is very user friendly. You can access many additional tools as part of this trading software. This includes Portfolio Builder, Market Scanner and Options Strategy. It is well-built for professional traders. There is a solid mobile offering available at Interactive Brokers. You have support for most devices and you are given everything needed to make a trade quickly. There are limited charting options and you can only set basic stock alerts. It does have some quirky features you will not find in most mobile offerings such as after hours charting and custom screening. You have everything here to allow you to effectively place your trades through your mobile device. There are many different types of brokerage accounts available at Interactive Brokers, being dependent on what type of trader you are. There are different options for institutional and professional traders. The standard single person brokerage account gives you access to all functions. In terms of margin, you have access to cash, portfolio and reg t margin. If you do not have at least $100,000 in average equity during a calendar month or have generated $10 worth of commission in a given calendar month, you will have to pay an inactivity fee of $10. 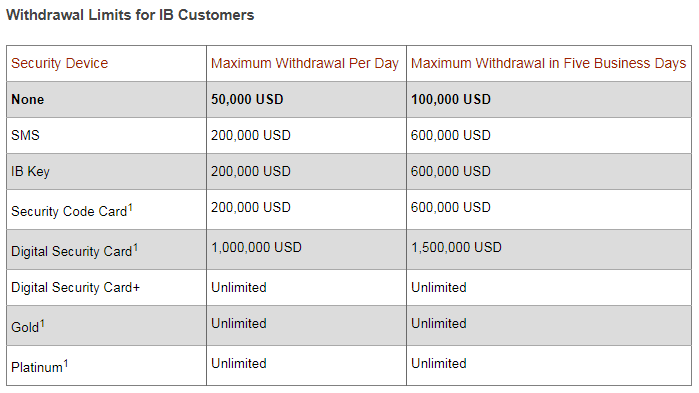 In terms of making a deposit to your Interactive Brokers account, there are a few different options. You can make a wire transfer with will not cost anything unless your own bank has a fee in place for this transaction. You can send them a cheque by mail or deposit via cheque through a mobile deposit system. You can also make withdrawals with each of the deposit options. There are maximum withdrawals per day and per five day periods depending on the type of security device you are using to make the withdrawal. Just like most online brokers in this day and age, there is 24/7 customer support offered by Interactive Brokers. You can get in touch with them through telephone, email or by their online live chat feature through their website. There are a few different languages catered for as part of the customer support services. These include Russian, Spanish, Italian, French, German and English. They do tend to have somewhat long waiting times for more complex issues, especially when sending communication through email. The design for the customer support queries is also very outdated. Interactive Brokers are well-regulated, being under the watchful eye of the likes of the SEC and FCA. They are also listed on the New York Stock Exchange through their parent company. They have regulatory cover in seven different jurisdictions across the world In European countries, they will insure deposits of up to £50,000 through the FCA. In the United States, securities worth $500,000 are covered, as well as cash deposits of up to $250,000 thanks to FINRA. There are also relationships with regulatory bodies in Canada, Australia, India, Japan and Hong Kong. One of the standout features of the Interactive Brokers security features is the use of security devices. These range from digital to physical devices. They offer a digital security card for accounts that have more than $500,000 worth of assets for example which adds a lot of extra security measures to the account. You can also use the mobile app to safely log into your account using a fingerprint or PIN code, as well as a password.